In Yemen's strategic Southern port of Aden, local militias are trying prevent a takeover by Houthi rebels from the North. The militias loyal to Yemen's embattled President, Abed Rabbu Hadi, are being assisted by airstrikes carried out by a Saudi Arabia led coalition. But they are poorly armed and many are just teenagers, as Orla Guerin reports. Until now, very little has been known for sure about the way that babies experience pain and it had been thought that young babies do not feel pain in the same way as adults. But a new study from the University of Oxford suggests the contrary. MRI scans of babies' brains found that 18 of the 20 pain regions are as active as an adult's. The study also suggests that infants might actually be more sensitive to pain than adults. Eleri Adams is clinical director of Newborn Care Services Oxford University Hospital. The former Conservative Prime Minister Sir John Major will warn today that a Labour government supported by the SNP would demand policies that favour Scotland at the expense of the rest of the UK. In his first substantial intervention in the election, Sir John will say that Labour would be pushed to the left by the SNP and open to political blackmail by the nationalists. Lord David Steel is the former Liberal Democrat leader. Today, the consumer watchdog “Which?” is launching a "super-complaint" against supermarkets. It claims they have confused customers for too long with money off offers which don't offer money off and "buy one get one free" deals where "free" is a pretty elastic term. The complaint by Which? goes to the heart of what is called "confusopoly " in mature, western markets. Kamal Ahmed is the BBC Business Editor. The European Union will discuss the worsening crisis in the Mediterranean at an extraordinary summit on Thursday. The Council President, Donald Tusk, said the situation was unacceptable and he expected proposals for immediate action. David Cameron, who is attending the meeting on Thursday, said "Britain can do more and lend a hand". The 27 survivors of Saturday's shipwreck arrived last night in Catania, Sicily. The captain and first mate of the boat have been arrested in Italy. Sarah Khan is the UNHCR senior protection officer for Libya. Childcare has become an issue in the election with all major parties trying to appeal to working parents. Currently three and four year olds are entitled to 15 hours of free childcare per week, as are two year olds from poorer backgrounds. The parties are all offering differing numbers of hours of free childcare and in some cases breakfast and after school clubs as well. Sanchia Berg reports. Just as in 2010 the scale of the national debt is one of the big debating points of this general election campaign. But what about the scale of personal debt? 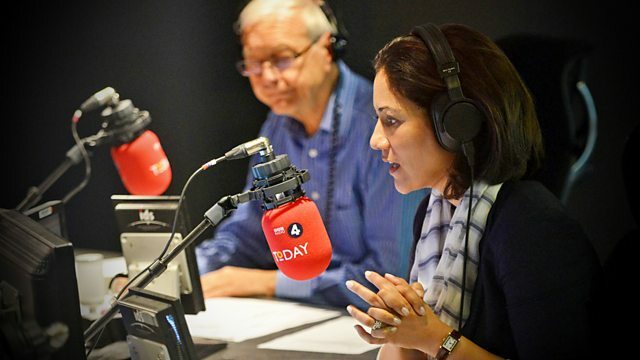 John Humphrys is on the road this week looking at the issues which many voters are grappling with in their day-to-day lives, as part of this programme's visits to 100 constituencies. He's been talking about debt with a group of people in Essex. The Japanese make much of their cherry blossom - now the UK may be heading for blossom to compare. The combination of sunny days and cold nights we have seen in the past few weeks are making this Spring an exceptionally good one for the country's blossom - it is lasting longer than usual, and is a visual treat, according to the Royal Horticultural Society. Guy Barter is chief Horticultural Advisor for Royal Horticultural Society at Wisley. Labour say on their first day in office they would write to colleges and universities urging them to re-open admissions to over-subscribed nursing courses. In a speech in northwest England Ed Miliband will say that 1,000 more places could be provided during the party's first year in office paid for by funds from a tax on expensive properties and a levy on the tobacco companies. Andy Burnham is the Shadow Health Secretary. It's now believed that eight-hundred migrants drowned when their boat sank off the Libyan coast on Sunday. A handful of survivors arrived in Italy late last night. Two of them - the boat's captain and a crew member - have been arrested for helping smuggle people. The tragedy has spurred the European Union to announce new measures to tackle the crisis in the Mediterranean. Ibrahim Dabbashi is Permanent Representative of Libya to the United Nations. The European Union will discuss the worsening crisis in the Mediterranean at an extraordinary summit on Thursday (see 0725). William Hague is the Conservative Leader of the House of Commons since 2014 and former Foreign Secretary from 2010 until 2014. A new satire on the general election is starting tonight: it is being filmed at the last-possible moment to make sure its satire is absolutely up-to-the-minute. Channel Four's “Ballot Monkeys” follows the election campaigners on the battle buses. The writers insist they are not worried about lack of material and think they can get enough of the "you couldn't make it up element" before transmission. Andy Hamlton is co- writer of “Ballot Monkeys” and John Crace is a Guardian political sketch writer. The former Conservative Prime Minister Sir John Major will warn today that a Labour government supported by the SNP would demand policies that favour Scotland at the expense of the rest of the UK (see 0710). Alastair Darling is a former Labour MP and Chancellor of the Exchequer from 2007 to 2010. The payday loan company Wonga is set to report its end of year results this morning. Simon Gompertz is the BBC’s Personal Finance Correspondent. How far can you change the shape of your child's brain? 200 years ago - saw the beginning of an experiment with the daughter of the poet Lord Byron to try to prevent her from becoming 'poetical' and turn her in to a sensible maths genius; Ada Lovelace, is now credited by some as the first ever computer programmer. Arts Correspondent, David Sillito reports on how the Ada experiment is continuing to resonate today, beginning at the drawing table of the artist Sydney Padua who has just completed a graphic novel based loosely on the life of Ada Lovelace. The Democratic Unionist Party manifesto is launched later today - could they be the king makers come May the 8th? Nigel Dodds is the Deputy Leader of the Democratic Unionist Party. The European Premiere of Avengers: Age of Ultron takes place in London tonight. It's the latest film from the wildly successful Marvel Cinematic Universe (MCU). The Avengers films bring together multiple superheroes including Iron Man, The Hulk, and Captain America. This film will see the Marvel Comics Cinema series overtake Harry Potter as the most successful film franchise of all time. Helen O'Hara is a film journalist who writes for Empire and GQ. Childcare has become an issue in the election with all major parties trying to appeal to working parents (see 0725). Are parents being swayed by these offers? Neil Leitch is chief executive of the Pre School Learning Alliance and Annie O'Leary is editor in chief of Netmums.